John Rivera had just completed his shift when he was gunned down. Two men have been arrested for the murder of Chicago police officer John Rivera, who was ambushed and gunned down hours after finishing his shift this weekend, authorities said Monday. Rivera, 23, was targeted because he was Hispanic, according to police. The killing unfolded early Saturday morning after two of the three offenders were in a fight on a party bus, said police. Accused shooter 24-year-old Menelik Jackson and another suspect -- whom police are still seeking -- "were involved in a dispute with a group of Hispanic men," Eddie Johnson, the superintendent of the Chicago Police Department, said at a news conference Monday. "In an act of cowardice, Mr. Jackson went to get a gun to settle this petty dispute, which resulted in him murdering the first Hispanic man that he came in contact with," Johnson said. (ABC News) An off-duty Chicago police officer was shot and killed while sitting in a vehicle early Saturday morning, March 23, 2019. At that time, Rivera was leaving a club with another off-duty officer and several friends, police said. As Rivera and his friends got into their car, three suspects approached their car and one suspect fired multiple rounds into the car, police said. "When shots were fired, Rivera leaned over and shielded his girlfriend with his body from the gunfire," Chicago Police Department spokesman Anthony Guglielmi tweeted. Rivera was shot and killed. One of Rivera's friends was also shot and wounded, police said. It appears he will survive, Johnson said Monday. Hate crime charges are possible, Johnson said. The suspected gunman, Jackson, had once applied to be Chicago Police officer, but during the application process, he was arrested during a polygraph test for a background check for committing an armed home invasion, according to police. A judge put Jackson on probation, said Guglielmi. Jackson "once thought he had what it took to wear a Chicago police star," Johnson said. But instead he allegedly committed the "ultimate disgrace" in "an act of cowardice," said Johnson. Jackson and his accused co-conspirator, Jovan Battle, 32, each face one felony count of first-degree murder and three felony counts of attempted murder, Guglielmi said on Twitter. Jackson also faces charges of resisting police, he said. 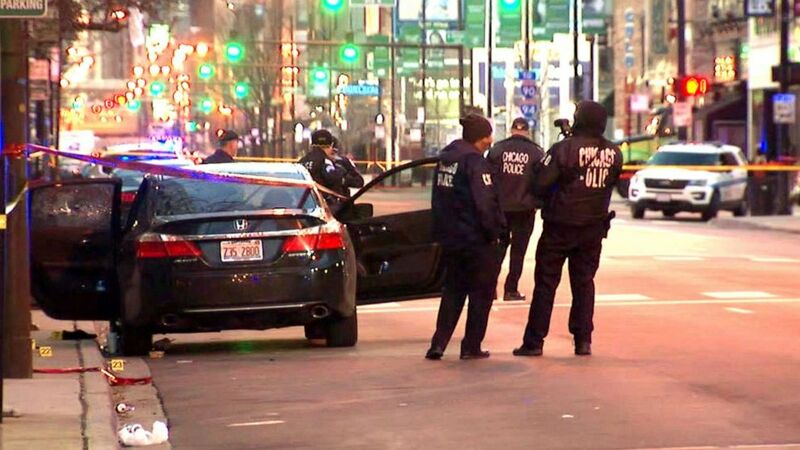 Guglielmi tweeted, "Cooperating witnesses, 18th District's strategic decision support center, cameras and license plate reader technology which allowed us to enter the plate of the gettaway car into a database, led police to the shooters car on south side and ultimately, his apartment." "It's just a shame, this kid, 23 years old, had his whole life and career ahead of him, and he gets gunned down senselessly," Johnson, the superintendent, said at a press conference Saturday. "Right now, I'm disgusted." ABC News' Ryan Burrow, Olivia Rubin and Stephanie Wash contributed to this report.